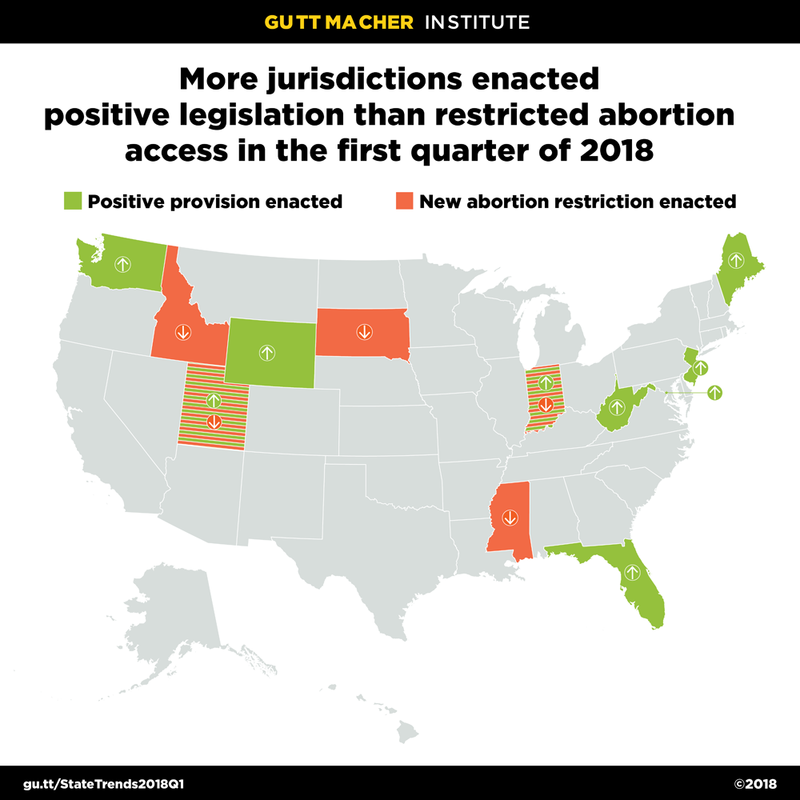 Despite the clear momentum to protect and even expand sexual and reproductive health and rights, the assault on abortion access continued in many states. By the end of the first quarter, five states had adopted 10 new abortion restrictions and 347 measures to restrict access to either abortion or contraception had been introduced in 37 states. Although legislators are moving to address sexual and reproductive health and rights in myriad ways, three key trends are evident at the end of the first quarter. Four states and DC adopted measures related to insurance coverage for contraception. Both DC and Washington state adopted comprehensive measures that, among other things, ensure coverage of all contraceptive methods approved by the U.S. Food and Drug Administration (FDA), guarantee coverage of a 12-month supply at one time and prohibit cost sharing. Both measures require coverage of female sterilization; the Washington measure also covers male sterilization. In addition, the Washington measure ensures coverage of over-the-counter methods. Maine amended legislation it had adopted in 2017 to include coverage for sterilization without cost sharing; the legislation became law after the legislature overrode a veto by Gov. Paul LePage. Once these new laws take effect, 29 states and DC will guarantee coverage of all FDA-approved methods (see Insurance Coverage of Contraceptives). Utah and DC adopted measures allowing pharmacists to prescribe and dispense hormonal contraceptives—including oral contraceptives, rings and patches—to a patient without first procuring a prescription from a clinician. Pharmacists will be required to have patients complete a self-screening risk assessment and to counsel patients on self-administering contraceptives and their potential side effects and risks. The new Utah law applies to clients aged 18 and older. Utah and New Jersey also moved to expand access to publicly funded family planning services. Both adopted measures to require the state to apply to the federal government to expand eligibility for Medicaid-covered family planning services. The measure would expand coverage to individuals with an income up to 200% of the federal poverty level in New Jersey and up to 95% of the poverty level in Utah. (The federal poverty level is $20,780 for a family of three in 2018.) Twenty-five states have already secured federal permission to expand Medicaid eligibility for family planning (see Medicaid Family Planning Eligibility Expansions). New Jersey also re-instated $7.5 million in public funds for family planning services; former Gov. Chris Christie had vetoed this funding every year during his tenure. According to the United Nations, the United States had a higher maternal mortality ratio than most other high-income countries in 2015. Moreover, levels of maternal mortality in the United States show dramatic disparities by race. According to the federal Centers for Disease Control and Prevention, the maternal mortality ratio for black women (43.5 deaths per 100,000 live births) was more than three times as high as the ratio for white women (12.7 deaths per 100,000 live births) in 2011–2013. One way states have been working to address these unacceptable and disproportionate outcomes is by establishing commissions to investigate the incidence of maternal mortality and make recommendations for ways to reduce both overall levels and disparities by race and ethnicity. Thirty states have already established a commission. In 2018, legislators introduced measures in an additional 13 states and DC. In March, Indiana enacted a measure establishing a statewide maternal mortality review committee that will investigate cases of maternal morbidity and maternal mortality, determine the factors that contribute to these negative outcomes, identify clinical and public health interventions to improve systems of care and coordination, and develop and disseminate recommendations to prevent future maternal morbidity and maternal mortality. A similar measure is awaiting signature by DC Mayor Muriel Bowser. In addition, legislators in 12 states introduced measures seeking to reduce maternal mortality by expanding access to health care. These measures generally require state agencies to prioritize reducing racial and ethnic disparities in both maternal mortality and access to prenatal care, expand treatment for substance abuse, improve access to mental health care for incarcerated women, and screen to identify conditions that present a serious threat to a woman’s life in the first year after delivery as well as provide referrals for women who need care. By the end of the first quarter, Florida had enacted a new law expanding access to care related to postpartum depression; measures to expand access to care for pregnant and postpartum women had passed at least one legislative chamber in Hawaii, Maryland and Missouri. So far this year, 308 new abortion restrictions have been introduced in 37 states. Out of this total, measures have passed at least one legislative chamber in 14 states and 10 new restrictions have been enacted in five states—Idaho, Indiana, Mississippi, South Dakota and Utah. For years, abortion opponents have sought to ban abortion under certain circumstances, either at a specified point in pregnancy or for specific reasons. Several states have enacted measures to ban abortion at 20 weeks postfertilization (equivalent to 22 weeks after the woman’s last menstrual period); the U.S. Senate rejected a similar measure in January. In March, Mississippi moved the time frame even earlier, enacting a law banning abortion at 15 weeks after the woman’s last menstrual period; enforcement of the measure was temporarily blocked following a legal challenge the day after Gov. Phil Bryant (R) signed the legislation into law. A bill to ban a safe abortion method that is commonly used in the second trimester has passed both houses of the Kentucky legislature and is awaiting signature by Gov. Matt Bevin (R). In addition, the Iowa Senate approved a measure to ban abortion at six weeks; it is awaiting action in the House. Both Idaho and Indiana enacted measures to require additional reporting of abortion complications; a similar measure was approved by one legislative chamber in Arizona. These measures seem to be in response to the 2016 U.S. Supreme Court ruling in Whole Woman’s Health v. Hellerstedt that underscored the importance of evidence in evaluating the impact of abortion restrictions. These measures appear aimed at generating data on the risks associated with obtaining an abortion. Four states have enacted new abortion counseling measures already this year. South Dakota amended its existing law in response to the state’s only abortion clinic’s counseling practice of informing patients that the information they are provided about fetal personhood is required by state law. The new law states that the abortion clinic is inadequately complying with the requirement that the abortion provider inform patients that “an abortion will terminate the life of a whole, separate, unique and living human being.” The new law requires that patients receive this information from a crisis pregnancy center; however, it is blocked from enforcement because of ongoing litigation. (Five other states require the provision of similar information.) A new law in Idaho requires abortion providers to tell patients that there is a possibility that a medication abortion can be reversed after taking the first of the two drugs in the regimen; four other states have similar laws (see Counseling and Waiting Periods for Abortion). Indiana adopted a measure to require that abortion patients receive information on relinquishing an infant up to 30 days old and Utah moved to redesign its abortion counseling materials, although the new law does not alter the content of the information to be provided to patients.